happy reading face, originally uploaded by Venus In Furs. He's making giant strides towards independence lately. It's like he has NO IDEA that he's only a year and a half old and can't do some things on his own yet. Just this week he's shown great interest in books with real paper pages (rather than sturdy board books I keep encouraging him to read so as not to destroy the others) and he can turn the pages rather than just maul them. Last week he decided that he was going to climb into regular chairs (like dining or desk) and sit in them like a big boy all on his own. 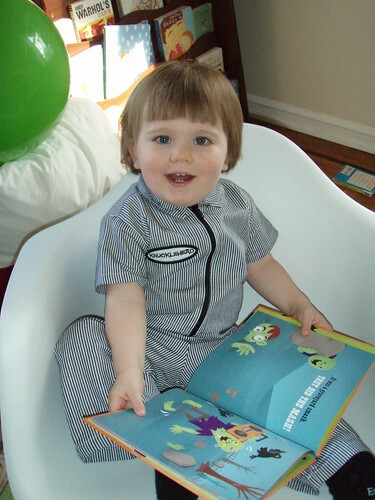 The photo accompanying this post is him in his rocking chair, with his Monster Mash book- perfectly illustrates his milestones because he climbed up into the chair himself with his book and flipped through it on his own. He's getting really good at saying 'hat' and 'hot' and waves 'bye bye' at things appropriately. His next checkup (18 month!) is next week and I'll update this with the requisite stats. Also, Christmas is coming up and Hanukah is here.... We're hoping you're all happy and healthy and with the ones you love.